The Kimber Micro was initially offered in .380 ACP caliber, and a year later Kimber added a 9mm Micro lineup. 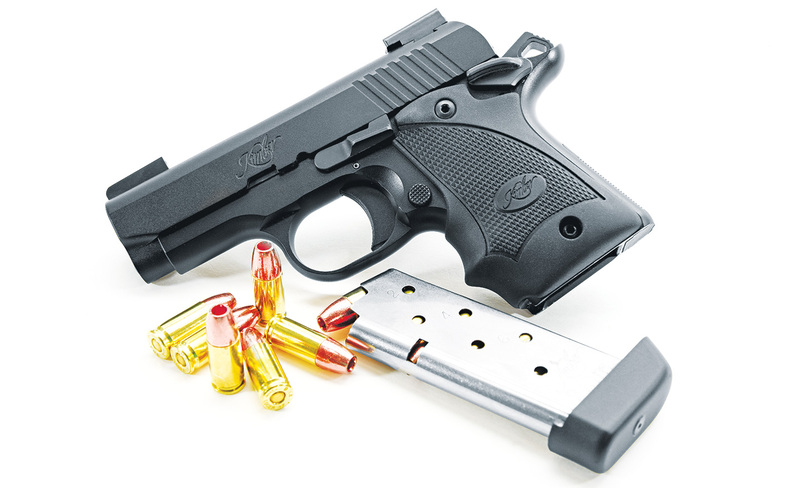 It’s a line of pistols Kimber has been aggressively expanding—it currently encompasses 14 models—and one of the newest is the Nightfall D/N (Day/Night) version. It’s one of five Day/Night models in the Micro 9 family. The gun stands out from its stablemates thanks to its Hogue rubber wraparound finger-groove grips. These sport the Kimber name, and they provide a comfortable fit and soften the felt recoil of even the stoutest 9mm +P rounds. That’s right. The Micro is rated for +P, although Kimber notes extensive use of this high-pressure ammo will shorten the pistol’s service life. If you’re wondering about whether the size and the stickiness of the rubber grip would make it difficult to carry in a pocket, I carried it in a DeSantis Nemesis pocket holster and discovered the rubber grip did not hinder my ability to draw the Micro cleanly from a pocket. I mentioned this gun is a Day/Night model. This means the gun features Truglo TFX Pro Day/Night fiber-optic/tritium sights. These are scaled to the smaller Micro and dovetailed into the slide. The rear sight also has a 90-degree front edge that can be used to do an emergency one-hand slide manipulation. 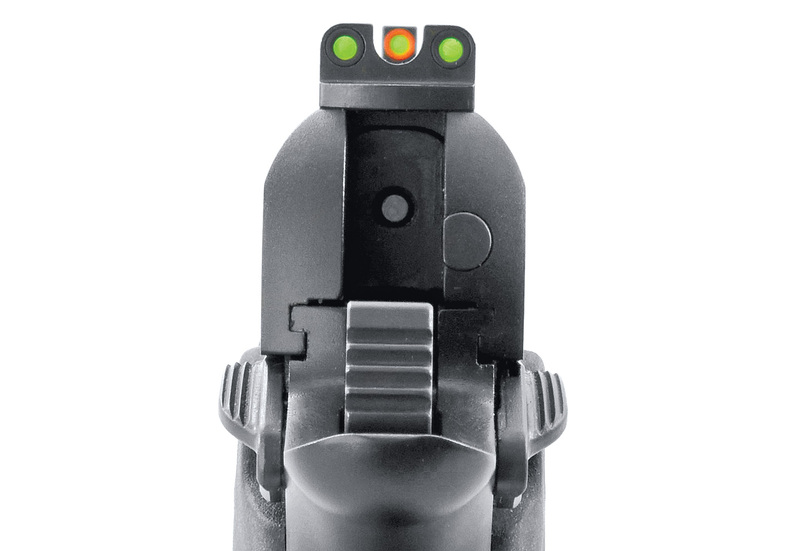 The Truglo day/night sights on the Nightfall combine tritium for low light and fiber optics for normal light, making them among the best and most useful sights on the market. These sights are tritium-powered for good visibility in low light, and the green fiber-optic elements in the front and rear offer extremely fast sight acquisition and a defined sight picture in good lighting conditions. Additionally, the front sight’s green fiber-optic insert is surrounded by a bright orange circle that draws the eye to the sight. This is one of the best sets of sights I have used on any of the defensive subcompact pistols. The matte black stainless steel slide incorporates a firing pin safety that prevents the pistol from firing unless the trigger is pressed to the rear. It has a traditional 1911-style internal extractor and a large ejection port with a relief cut at the rear to ensure positive ejection. The rear of the slide has seven forward slanting grooves for positive grasping and manipulation. The slide and recoil spring are easy to pull, making it user-friendly for those with less power in their hands and wrists. The Micro 9 does not use the traditional 1911 removable barrel bushing. Its bull barrel flares slightly to lock up solidly and provide great accuracy. The frame is black anodized aluminum and reduces the overall weight of the Micro to just 22 ounces fully loaded. A beavertail rear grip tang surrounds the cocked hammer and prevents hammer bite to big hands and also effectively spreads the snappy recoil impulse across the hand’s web. The mainspring housing is checkered at 25 lines per inch. The smooth-faced trigger is pinned in place and pivots to the rear. 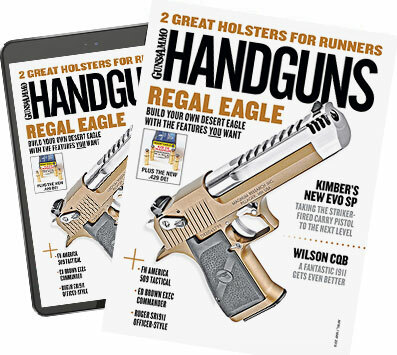 Trigger weight runs in the seven-pound range, which is a good compromise for a pistol designed for high-stress situations. The ejector in the Micro is spring-loaded and acts not only to clear fired cases but also is part of the firing pin safety mechanism. When reassembling the slide and barrel onto the frame, be sure to push the ejector forward to allow the slide to move rearward. If you fail to clear it, the slide will strike it and can damage the pistol. The stainless 3.15-inch barrel has a small cutout at the top rear of the hood that acts as a loaded-chamber indicator. The barrel has an integral feed ramp that ensures feed reliability and adds support to the cartridge case head. The locking system uses a camming barrel lug instead of the link of the 1911. The Nightfall is available with an ambi safety at additional cost. As a lefty, Chudwin found the right-side safety on his sample to be tight and on the sharp side. The Micro 9 doesn’t incorporate a grip safety, but it does have a manual thumb safety. Unlike a typical 1911’s, it can be engaged when the hammer is either cocked or uncocked. The slide can also be cycled with the safety on. I’m a lefty, so I requested a version with an ambidextrous thumb safety, which is available at additional cost. I found the right-side safety lever to be tight and the edge too sharp. After testing the Nightfall with 400 rounds of ball and hollowpoint ammo, function was 100 percent, right out of the box. The sole provided magazine was easy to load and has a finger extension that makes for a longer gripping surface. I believe you should always carry a spare magazine, so I think Kimber needs to add a second mag to the package. The Micro 9 offers seven rounds of 9mm and is rated for +P. Chudwin wishes the company would furnish more than one mag. The Nightfall proved consistently accurate with all ammo tested. Several groups had multiple rounds in a ragged hole and a flyer or two that I take responsibility for. 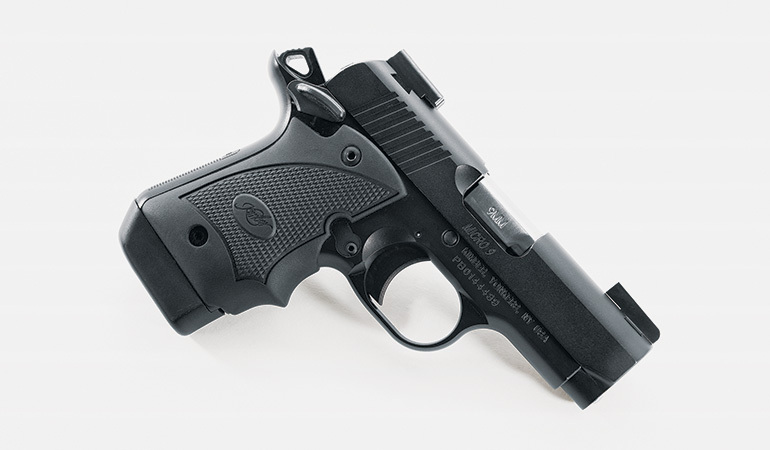 The Kimber Micro 9 Nightfall is a serious pistol designed for personal defense. 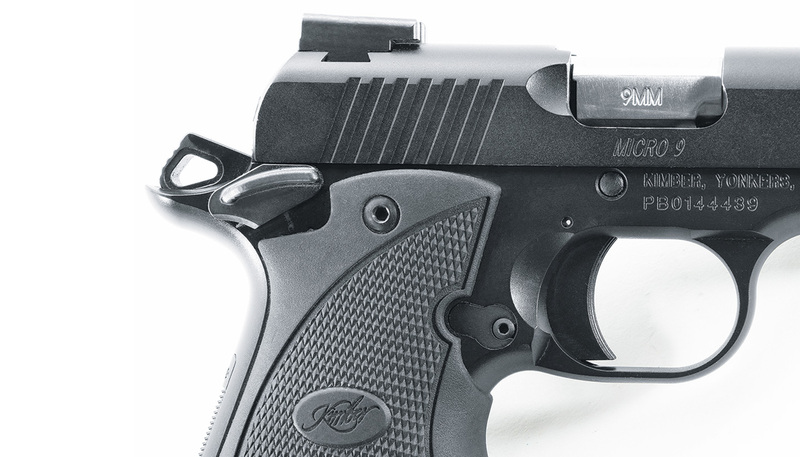 It has excellent ergonomics and is very accurate, especially for such a small pistol. The light weight allows comfortable carry. As long as you do your job and commit to practice, the Micro 9 Nightfall will prove a faithful companion.